KJIPUKTUK (Halifax) – A recently published report shows that incomes for people on welfare in Nova Scotia are entirely insufficient, and on a downward trajectory. They are also by and large the lowest in Canada. 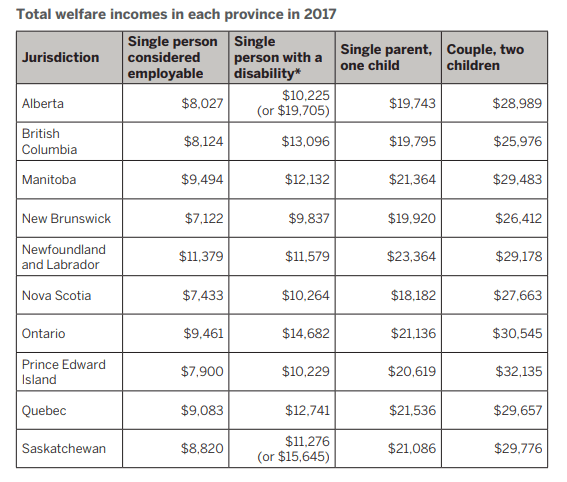 For instance, in Nova Scotia the welfare income of a single person with a disability in real dollars has decreased from a high of $13,613 in 1980 to a puny $10,264 in 2017. A single person deemed employable received $6,672 in 1996, after the Province took on these payments from the municipalities. In 2017 that same person received $7,433. That’s a slight increase but still less than the $7,514 she received in 2013, when the current Liberal government took power. These numbers include not only social assistance payments, but also all available federal and provincial tax credits. All this according to a report issued by Maytree in November of this year. Maytree started to publish this yearly report in 2017, taking over from the now defunct Caledon Institute. Welfare income for a single parent with one child after adjustment for inflation has been going up and down since 1990, but in real dollars the 2017 income of $18,182 is still below the 1991 high of $18,839. Only couples with two children has seen some improvement over the years, largely the result of more generous federal child benefits. 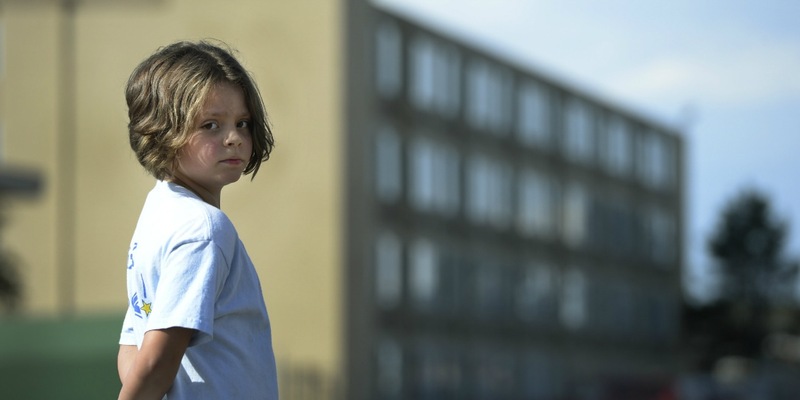 How poor are Nova Scotia’s welfare recipients? All these dollar figures are fairly abstract. How inadequate are welfare payments in Nova Scotia really? MBM is based on the cost of a specific basket of goods and services representing a modest, basic standard of living. It includes the cost of food, clothing, footwear, transportation, shelter and other expenses. Recently, the Government of Canada announced that the MBM will be used as Canada’s Official Poverty Line. Here is the table that compares what you really need and what you actually get. The table applies to people who live in Halifax, because MBM is calculated on a community basis. A single person deemed employable receives only 38% of what she should receive to live a half-decent life! A person with a disability only gets half that amount! Even a couple with two children, comparatively well-off in Nova Scotia, only receives 77% of what is required! Let this sink in. And yes, I am pulling out the exclamation marks for this. How does Nova Scotia compare with other provinces? Canada-wide Nova Scotia can indeed claim bragging rights for being the most miserly province, as the following table shows. What about that historic increase in 2015? And remember the $20 increase in welfare payments then Community Services minister Joanne Bernard kept mentioning? It was celebrated as “the largest increase ever,” by premier McNeil, which was repeated unquestioningly by all the news media in this province. We argued on these pages that taking into account inflation it was a mere pittance. That increase happened in 2015. Taking into account inflation, a full year later, in 2016, a single person deemed employable received an additional $66 over the entire year, the report shows. A single person with a disability got $25 more in 2016 than the previous year. And in 2017 that same person was once again $34 poorer than the year before, and back into a downward spiral. I’m a single parent on welfare I receive much less than the reported 18k, try just over 10k for a family of two. Hello Vincent, what are we missing? 18k supposedly includes all federal and provincial tax credits you’d be eligible for. A friend of mine had her heat costs removed several years ago. They want the poor and sick to freeze in their homes. Only problem with tax credits is if you’ve been disabled your whole life and unable to work you haven’t paid in so you don’t get anything back. I disagree. Nova Scotia’s aren’t getting everything they need or should be getting. Many of our poor have no phone, it is a necessity today, especially if you have children, but the case workers don’t allow for it. Same for the internet, the government has deemed it an essential service but has thus far refused to give any sort of credit to the families who could benefit greatly from it. Stop to realize, children need it for homework today. If they don’t have it then they can’t keep up in the classroom. So, our poor don’t have the necessities to start with and yes, many go without heat or medicine. It’s appalling and shameful that in this day and age, a person has to decide to freeze or starve …….. some choice isn’t it ? Why aren’t we looking into the bonuses paid to case workers for withholding services ? I’m sure “that” money could be better spent in the system. And yet they wonder why people commit a crime, you have to eat somehow. I couldn’t help but notice that you have left out any info regarding separated couples. If one of the parties is supposed to be receiving court ordered support from their spouse for an indefinite time because they can not support themselves, and the spouse refuses to pay the support, there is supposed to be a reciprocal relationship between the Maintenance enforcement program & the Social services program that allows the recipient to at least collect enough from them to “somewhat” live on, and when the province’s enforcement programs are able to get garnished funds from the spouse, they ( the Government, social services), get paid back with “your money”, so they technically would not be out anything and would it not be even necessary to have this agreement between each other if the system of collections on spouses even worked in the first place. If you end up owning a home, because you had to sell yours as part of the separation settlement, and then have no where to live, and rather than use what little you got for your share of the sale to pay rent to someone else for maybe a year, you purchase a cheap home with someone other than your spouse to ensure at the very least, a roof over your head that isn’t costing you somewhere else the thousand a month you don’t have, and then you go to them to ask for the help that is supposed to be there, you are point blank then told…you are living common law, although you are not. You just chose to not have no where to go again in another 12 months. Are you then also aware, that they can & will then tell you point blank, to convince this other owner (that is in no better shape than you) to sell the home, spend all the money you get for it in rent somewhere else, and come back & see them when you are completely broke, AND, oh by the way, if you don’t like our decision, you can start an appeal process. My spouse owes me well over “$Sixty One Thousand !! ” . The enforcement program managed to garnish just shy of $7,ooo last year out of the court ordered “24”. This is what the province expects me to live on. Why not update your article to reflect these situations as well. It’s all of it, every story you will hear… very appalling. want to know more… this is just a drop in the bucket regarding my last 7 years.